At the Jets game with the Siena Boys! 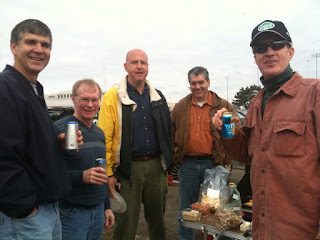 From left to right: John Latino ('77), Mike Kelley ('76), John O'Grady ('76), Tasos Papagiannopoulos (friend of John O'Grady), and Mike Nestor ('77). Rich Kokel ('77) was also at the game but, as usual, was running late and missed the photo-op. As always, it was excellent getting together with the boys. Sadly, the Jets went down to a crushing last-second defeat at the hands of the lowly Jacksonville Jaguars. Meet Herbert Frankel: My Fourth Cousin Twice Removed! This just in from Dympna (Messenger) Le Rasle: "Hi Paul; Just writing to let you know that we have another member of the family to add to the family tree. 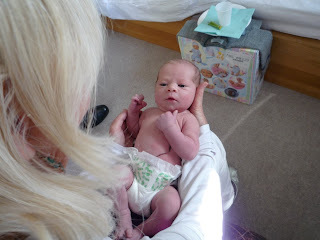 My daughter Madeleine gave birth to Herbie Hucklebury Timothy Peter Frankel on 7th September 2009. I would have told you earlier but hadn’t got round to getting the photos up, I am attaching a photo of him at 3 days old for the blog." The photo above shows Dympna, the proud grandmom, holding Herbie. Herbie may be little but, as far as I can tell, he is the holder of what may well be the heftiest name on the Family Tree. I'm going to need a double-wide box on the Tree to accommodate it! Welcome to the Family, Herbie! "Growing up in North Philadelphia's Frankford section, who knows why my Dad fell in love with Notre Dame Football. Could it have been being one of the few Catholics in his neighborhood and seeing the team rise to national fame on their merits alone despite their religion (remember there was a time when Catholics were not held in the highest regard)? Possibly. Could it have been the association with the 'Fighting Irish' and his Irish heritage? Possibly. But regardless of why, one thing we always knew growing up in Mom and Dad's house was that Saturday afternoons were made for Notre Dame. Any chores or work that had to be done could be put on hold for a few hours. From my Dad's one knee stance in front of the television with left elbow on left knee and right hand on the TV set (even though we only had one, it was always called a set), and a delightful scream of 'Hot damn!! There he goes! ', there was no question what Dad's favorite football team is, was, and forever shall be world without end. Amen." "We always knew how much he loved the games, and we did attend a few locally. A couple of ND vs. Navy games at the Meadowlands and an Army vs. ND at Veterans Stadium were also part of the history. The ultimate goal was always a game in South Bend. 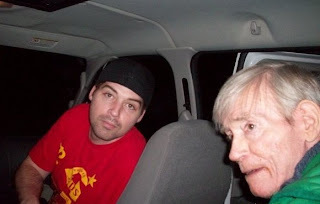 Dad has battled Parkinson's for years, and we felt that now could be the time to go. Time to see 'Touchdown Jesus', time to see 'The Golden Dome', time to sit in those stands and cheer on the Fighting Irish." "We left on Thursday October 22 at 10pm from the Peikin residence in North Wales, PA. Our vehicle of choice was a Ford Econoline 15 Passenger Van. We did the most cliché thing we could think of: we watched the move "Rudy" on the way. The goal was to be in South Bend by early Friday morning and bypass all traffic by driving through the night." "When we arrived in South Bend at approximately 9:45am we had only moments to prepare for the first event. Thanks to our eldest brother, Timothy, we had lunch at the behest of Coach Charlie Weis and his wife, with a number of Notre Dame VIP's, coaches, players, all stars and other die hard fans. While waiting for the food to be served we were able to check out all of the history that is Notre Dame: the Heisman's, the National Titles, the gas cap from the plane Knute Rockne was killed in, and the countless other relics of a team etched into the hearts and minds of her faithful fans. Lunch was pretty cool -- there was a local ND Football talk show which took place on stage. They had a number of guests interviewed including safety Sergio Brown and running game coordinator Frank Verducci. (Jersey Guy, Seton Hall Prep grad). It was quite a memorable event." "Fast forward to the hotel, where we all crashed for a several hours to get our clocks back on track. The next event was the Pep Rally. In typical and predictable Sears Family fashion, we were so late we missed it!! Who would have thought??" "Saturday, the 24th: Game Day. Anyone who knows college football recognizes the rivalry between Boston College and Notre Dame (The Holy War) which was one of the reasons this game was so sweet. Despite the rainy weather we were all looking forward to the game. Stocked with blankets, ponchos, smuggle-able snacks, umbrellas, and much more, we looked more suitable for a homeless shelter's soup kitchen meal than a D1-A football game!!" 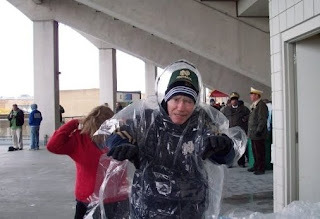 Harry in Poncho doing his "Frankenstein"
"Prior to the game, Dad watched from the balcony of the mezzanine as the ND Marching Band strutted in. He mentioned 'It doesn't get any better than this!' Exactly then, Timothy unveiled another surprise for Dad: Pre-Game Field Passes. Yes, that's right! Harry C. Sears who watched ND Football games for so long that 'watching' the game meant staring at the Zenith radio, was now going on that sacred field. Dad and Tim made it down to the field, seeing the band, the ND leprechaun, the cheerleaders and the field that has become hallowed ground. The pinnacle of the Pre-Game was seeing those golden helmets rush through the tunnel and take the field. Making their way back to the stands, Tim and Dad settled in with the rest of us: Mom, Colleen, Sharon, Patrick, Shawn, me, Kerrianne, and her guy Igino (pronounced Gino)." "Much to our surprise the rain let up, and we were all blessed with one of the most exciting games to date. Every ritual we've seen time and time again on television seemed larger than life in person. Notre Dame 20 Boston College 16. This game apparently marked the end of “The Holy War” series: 34 years of competition between the only two Catholic Universities in the US to compete at the Division 1-A level. Imagine Harry in 1975 watching the first “Holy War,” sitting in his sansa-belt slacks, drinking Pabst Blue Ribbon or perhaps even a Genesee Cream Ale, maybe complaining about Gerald Ford a bit. At the age of 47 he had no grand kids, his sixth child not even born yet. Time can change just about everything." "Anyone who's made it to a game in South Bend knows a post game mass is in order. We rushed to the Basilica but it had filled up too fast. Instead we were lucky enough to find standing room at Sorin Hall, where a more intimate mass was on the menu. The return trip back to PA seemed longer than the ride there. The van seemed more crowded even though we had one less person (we left Tim at a rest stop because he was cranky. Just kidding! Kerri flew back to LA from Chicago). It was my first road trip with all of my siblings and parents (I’m 32) and one that none of us will forget. Life will always be busy. Life will always have very long to-do lists. 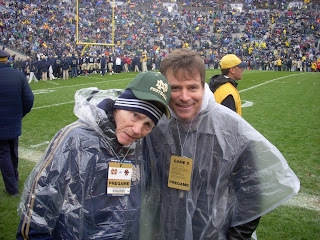 But no matter how we busy we are, we'll all always treasure this trip to Notre Dame with our quarterback, Harry C. Sears. Getting to see Dad, the golden helmets, Touchdown Jesus, and more -- all in one eyeful -- was the gift of a lifetime for us."